Learn the Latin you need. Gain the language skills you want. Practice Makes Perfect: Basic Latin is a trusted companion to your Latin learning experience. In each of the forty-one bite-sized lessons, author Randall Childree explains one or two language concepts and supports them with many clear examples. These lessons are purposely short so you can complete them in twenty minutes or less, and you can go at a pace that works for you. A comprehensive glossary of words frequently found in Latin speeches, poems, histories, and plays is a special feature. With 164 exercises, you will get plenty of practice, practice, practice using your new skills. 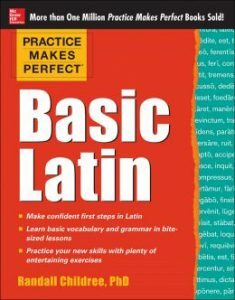 Whether you are learning on your own or taking a beginning Latin class, Practice Makes Perfect: Basic Latin will help you build your confidence.